Another rainy Tuesday night, another indoor sketching session for the Tuesday Night Sketchers. We emailed back and forth today, negotiating for an agreeable place to sketch. Finally Picante came to mind and everyone agreed it was perfect, with their great food and friendly neighborhood feel. Usually we move around sketching from different viewpoints, even within a restaurant. But with four of us tonight ( Micaela joined Sonia, Cathy and I) we parked ourselves in a comfy booth to eat and ended up staying in the same spot all evening. 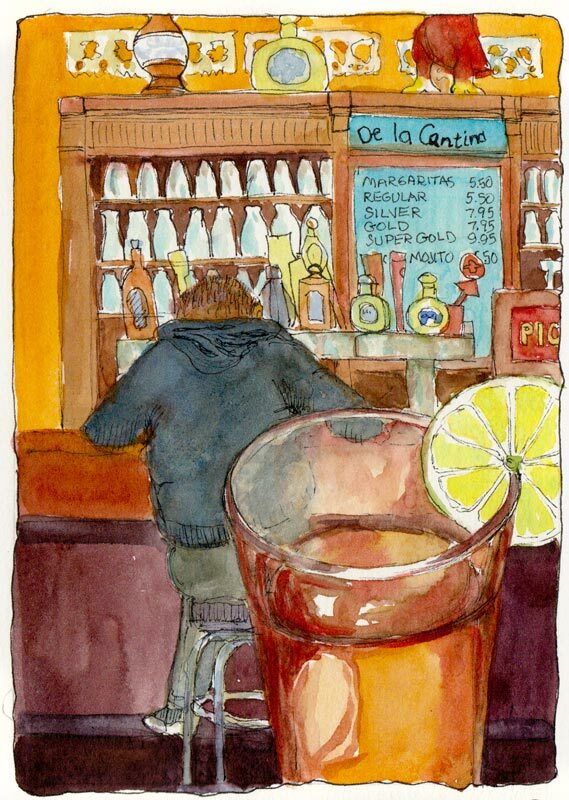 I started by drawing the iced tea in front of me and then turned to the right and drew the bar 10 feet away, putting it behind my tea. In reality, Sonia was sitting across the table from me and she was behind my tea. Everyone else made several sketches but I spent the whole evening on just one. It felt luxurious to take my time and savor each visual discovery, line and color. But then I felt a bit sheepish when I realized it was 9:00 and everyone else was done and waiting for me to finish so we could do our end of evening show and tell and go home. I really like this one. The turquoise in the sign is such a nice compliment to all the warm golds. I like that tea in the foreground, too… the 2 points of interest play off each other nicely. Well, I am thankful they were patient with you. This is wonderful! By the way, I finally sketched in public, by myself. I am so, so happy! I kept waiting for someone to get mad at me, or to make fun of my work, but no one even acted like they noticed! Hi Raena, Congratulations! That is actually the big secret surprise about sketching in public. People almost never notice or say anything and if they do, 99.9% of the time it’s positive and encouraging. Or they tell you about how they can’t draw a straight line or how their aunt/grandmother/son, etc. is an artist and blah blah blah. Honestly, I can only think of 3 times in my years of public sketching and painting that someone said something critical or acted annoyed. Once a woman in a cafe asked why I kept looking at her, asked if she know me, and then was perfectly happy when I told her I was just sketching her hat. The critic was a wanna-be artist who gave me advice about something irrelevant when I was painting, probably because I said I was just learning to paint plein air (which I was). Another person thought I was spying on her house and came out to ask what I was doing. I was drawing some odd flowers in her neighbors front yard but her house was in foreclosure and she was nervous about people snooping about seeming to be taking notes. What a treat to have this pop up on our google alert at the restaurant. I love the colors and feel you captured in the space, right up to the feet of the big red rooster atop the bar shelving. I sit in that spot a lot and drink the iced tea too. Thanks for choosing to have your Tuesday night sketching at Picante. If it’s okay with you, I will forward the link to the owner and managers. I think they’d enjoy it. Hi Barbara, Thanks for your kind words about my sketch. We had a wonderful time at Picante and thoroughly enjoyed our food as well the ambiance. My fellow artists made some nice sketches too which I’d be happy to share if so desired. And of course you’re welcome to forward the link on to the owners/managers. By the way the young woman cashier was particularly helpful and patient as I sorted out what to order last night and everyone working there made us feel like welcome guests. Oh this is so wonderful. Picante is great! Sonia PS I’ll send you my sketch Jana. Jana, this is so warm, and wonderful! Here’s a post of 2 of my sketches, which I colorized in Photoshop, not as charming! I love this – the color sare so warm and inviting – it must have been a great place to be on a rainy night. I love the watercolors and the idea of your Tuesday Night group. I’ve been thinking about this for weeks and have written this morning about your group and my desire to borrow the idea for a writing exercise. Borrowed your sketch above, hope that’s ok!! I love your sketch/painting. It is wonderful. I love the feeling of it. Your drawing group sounds like great fun. I love the sketch/painting and the idea of having a drawing group move around to different places while having fun eating or drinking. Lovely. Thanks. Your painting is truly beautiful. The use of your coloring is phenomenal! And your writing as well…” It felt luxurious to take my time and savor each visual discovery, line and color.” Great post! Keep it up! love the colour, atmosphere & composition!